“Lu Feke” by Joe Ostraff. Acylic & oil on canvas, 33 x 30. As minimal as the works are, one can find several levels of meaning and articulation working within Joe Ostraff’s sophisticated and nuanced canvases. They describe larger pictorial structures while at the same time addressing themselves intimately, thus speaking in variations to different aspects of a viewer’s receptivity. A new body of Ostraff’s work up at Phillips Gallery this month demonstrates the artist’s ability to employ a series of repeated motifs and compositional strategies to create varied works. Ostraff’s colors are reticent while daring and his textures raw and unpredictable. Ultimately, one is struck by the beauty of these elements that coalesce on the canvases in moments of serene grace. In “Lu Feke,” for instance, the eye is drawn to the central grid of penny-shaped disks that are spaced inexactly in rows of ten, the final row ending abruptly with only five. 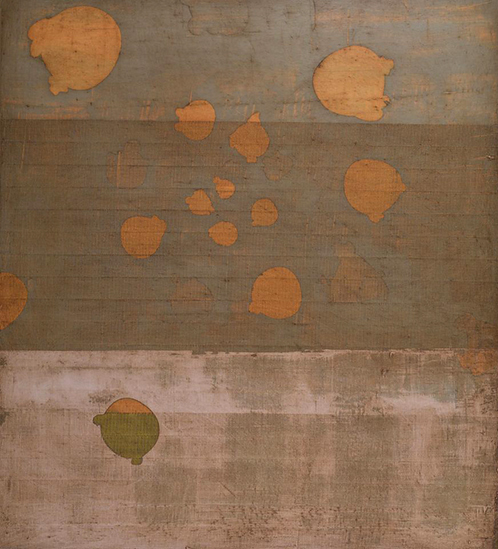 The discs are negative spaces laid on a canvas whose top half is muddied aqua and the lower half shades of brown and pink. The resulting colors of copper and lichen green remind one of copper as it oxidizes. The square that intersects both halves of the canvas and surrounds the disks is irregular, far from exact — nothing is quite even and everything is crude and raw. There is a natural simplicity about the work, a reductive beauty as one might find in a pattern in nature such as form in rock or in space. This pattern of discs, or one similar to it, is repeated in a variety of paintings, appearing in the Logos series as well as the long “Untitled #23,” their formal qualities transformed by Ostraff’s shifts in palette or compositional elements. “Domestic #6″ by Joe Ostraff. Acrylic and oil on canvas, 44″ x 40”. In Ostraff’s series of “Domestic” paintings, the repeated circular patterns give way to collections of irregularly shaped splotches, spread haphazardly across the painting’s surface. But these works share elemental similarities with the more regimental works. They too skirt a fine line between the natural and the artificial. A work like “Domestic #6” can be seen as rendered by the human hand while at the same time its beauty could have a natural source. Like “Lu Feke” it maintains a pattern of beauty derived from colors that are raw and crude yet for their organic quality are seen as beautiful. The composition is both arbitrary and contrived with unnatural line separating two areas of unlike color towards the bottom, with shapes that lean towards the natural — arbitrary forms floating in space of pure color. These patterns are only one level on which these paintings resonant. Ostaff’s sectioning of the canvases, into halves and thirds, creates a miniscule level that creates dynamic energies. In “Lu Feke” a simple line is randomly grooved from beside one of the circles, colliding and intersecting another accidental groove to create a surface of crisscrosses. 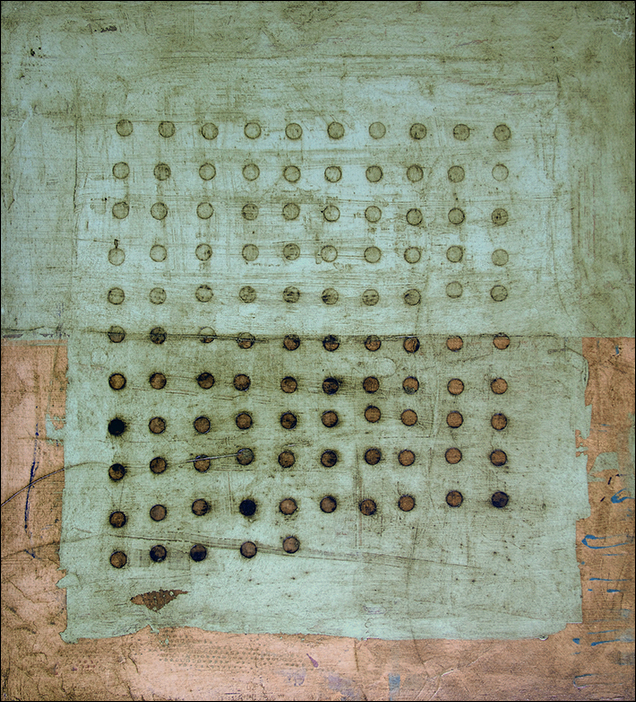 “Domestic #6” has a unique and very intentionally nuanced surface. Divisions and lines are created by slight shifts in translucent tones, but also by a thickly applied layer of paint that has been hatched with a grating like texture in its density. The areas of pure color in space on closer examination seem slightly recessed, as if form were painted over and peeled away leaving a slightly raised edge with varying densities. These lines suggest another dynamic happening in Ostraff’s works, his layering of the cognitive and the emotional. His variations of paint application, and sophisticated interlacing of composition create dynamic pieces that speak both to the cognitive, the grid of the logos, and the sensual and emotional of the domestic. Joe Ostraff’s work will be at Salt Lake’s Phillips Gallery through April 12. The gallery is located at 444 E. 200 S. and they are open Tuesday – Friday 11am to 6pm and Saturday 11am to 4pm. Showing concurrently are sculptures by Heidi Moller Somsen (see our March 25th post). “Logos #9″ by Joe Ostraff. Acrylic & oil on canvas, 18″ x 18”. Is this the Joe Ostroff that grew up in Laguna Beach, CA.??????????? This is Eve Thompson = (Teri Perine’s friend ) = we were both artists also. Yes, I am still paintings also.